Wireless alarm monitoring systems are an option you might consider for securing your home or business against theft. Most people consider it a money-saving option, because you don't have to pay an electrician or professional for installation. Here's how the systems work. The base units and sensors are typically powered by a 9-volt battery, the type found in most non-wired smoke detectors. The number of sensors included varies, depending on the brand and model. Most manufacturers include a set number of sensors and offer additional sensors as accessories. Other features may include a panic button for injured or elderly individuals, video door intercom and voice activation. AC adaptors are usually available for the main control units. The AC adaptor allows you to plug the system into any wall outlet, which will reduce the number of batteries you need to buy and replace. A wireless home security system may work in one of two ways. The first is referred to as central station monitoring. In the event that a sensor detects an intruder, the unit within your home contacts a manned central station. If a two-way feature is included, the central station will call the home number to verify that an emergency is indeed underway before notifying the police department. The two-way feature helps to prevent false alarms. If the call goes unanswered, the police will be contacted. A code word can be used in the event that a burglar is actually present in the home. If the code word is used, the police will be notified to arrive quietly. Central monitoring is a subscription service. Fees are paid monthly and vary depending on the service provider. 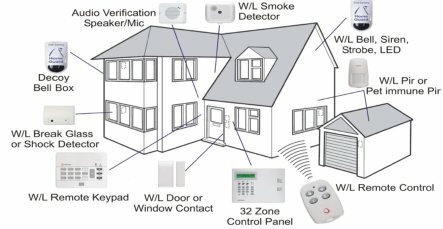 The second type of wireless home security system is a kind of small computer that has been programmed to call up to five numbers when motion is detected, a door opens or a window is raised. The motion detection ranges and angles vary. An 8 yard detection range is very easy to find. Any movement within a 110 degree arc of the base unit will be detected. The systems are easy to arm and disarm. They are relatively easy to install and instruction manuals are included. Either type of alarm will work if the power is cut. If the AC adaptor is being used on a base unit, you should be sure that the battery backup is fresh and installed. They will work if the phone lines are cut, as well. Wireless alarm monitoring systems make use of cell phone lines. Even the smartest burglar cannot bypass them.